Northeast United FC host ATK in their 11th game of the season in the Indian Super League tomorrow. The Highlanders have had the best start in the history of ISL, and they will look to keep their good performance going when they face the two-time champions ATK. ATK, on the other hand, have had a moderate start to the ISL and have amassed 15 points from 10 games and will look to keep their slow rise something which is synonymous with Steve Coppell. 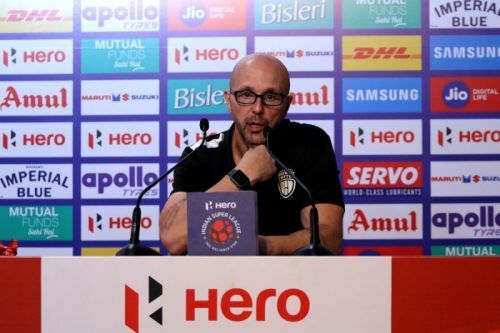 Eelco Schattorie, the Northeast United FC coach, felt that their primary concern for tomorrows game is fatigue as it is their fifth game in a short period. "Another concern for me is that we don't want to be Victims of our own success." is what Eelco Schattorie said regarding the issues that are keeping him worried before the game against ATK. "The good thing is Jamshedpur, Bengaluru and ATK all have similar styles of defending and play in more or less the same formation (4-2-3-1, 4-4-2), and that is good for us because two of our previous opponents were Jamshedpur and Bengaluru." Eelco on the style of play that ATK had. "ATK's offensive part is entirely different from the other teams we played, so that is something we have to watch out for. But, we will need to work open their defence to create chances." is what the Northeast United gaffer had to say regarding his strategy for tomorrows game. The coach also mentioned that the injury to Provat Lakhra was a significant blow for his side as he was getting the youngster from Bengal into the starting XI in an adequately planned manner. The coach also mentioned that when one plans for a player like Lakhra to be inducted into the team at the correct time and then lose him to injury is very painful. Regarding the options present on the bench the coach mentioned that he isn't someone who is willing to change around just for the sake of changing and that "Success comes from Stability". Eelco said that the players on the bench need to keep working hard in training and when the time is right and their presence required the gaffer would play them. "There is no secret for a late rise, getting to know the squad sometimes takes time. The variety present in the team and the sequences one can use knowing those things usually takes time." Steve Coppell regarding his trait of starting slowly and then getting his sides to rise during the second phase of the tournament. ATK lost of NEUFC when both the sides met in Kolkata this season. But, Steve Coppell doesn't feel that match's result should be the criteria to judge the teams for tomorrows game and said that "I think that result was a fake result as we were a man down within 30minutes of the game and then we defended and even Northeast couldn't play their natural game." "Northeast has improved a lot these days and are winning games. The position they are in is not due to an accident, and they are playing good football. It will be a tough game tomorrow. "Steve Coppell on his opponents for tomorrow Northeast United FC. "When Stephen (Indian National Team Coach) arrived in India 4-5 years back, they were 150-170 in the FIFA rankings now they are in the '90s, and that is a vast improvement. The ISL has a lot to do regarding the success of the national team. The level of Indian players has also gone up, and with five years of proper and regular high-class training (due to to the ISL) the players are performing better for club and country. "Steve Coppell on the impact of the ISL in Indian Football and the changes that have occurred in the past three years since he has come to India. The former Manchester United winger mentioned the significant change during his three years in India football has been the rise in quality of the Indian players. ATK will be missing the services of Pronoy Halder who has a broken nose and Cavin Lobo who is suffering from viral fever. Northeast United FC will be missing Provat Lakhra who probably has an ankle fracture, Rupert Nongrum who is in rehab, Kivi Zhimomi who too is in rehab. ISL 2018-19: Will the NorthEast slip away once again? ISL 2018-19: Can Northeast United FC maintain their early-season momentum?